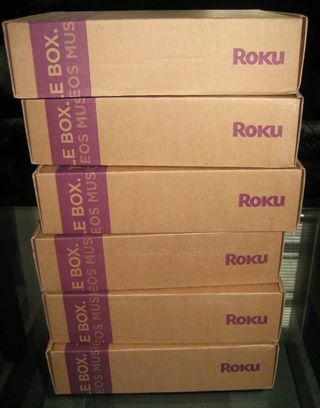 Thanks to the very generous folks at Roku, I have six Roku XDS units to give away next week at the Broadband Device Pavilion in NYC. All you have to do is stop by the pavilion and enter the drawing. We'll also be giving away prizes from Logitech, MLB.TV, Apple, Netflix, Xbox, Boxee, VUDU, Western Digital and others. The Broadband Device Pavilion is your chance to get hands on with devices and platforms from: Apple, Roku, Microsoft, Netflix, VUDU, Blockbuster, Sony, Vizio, Samsung, Western Digital, Seagate, Boxee, TiVo, Nintendo, HBO, Hulu, Amazon, ESPN, EPIX, Toshiba, BlackBerry, LG, Sharp, OnLive and more. This is your chance to compare all of these devices and platforms in action, side-by-side, and check out what each platform offers in the way of content and video quality. All you need to do is register online for a FREE exhibits pass and you'll have complete access to the Broadband Device Pavilion, plus all the keynotes, networking events and exhibit hall.